The end of the year is a great time to look back and have a frank and earnest look at how we have lead our worship team over the last 12 months. The fact is, whatever we cannot evaluate we cannot change. Or if we can change it, what do we change it into? evaluating your ministry is an essential part of getting better at the ministry the Lord has called you to. Even the best worship leaders on the planet constantly reevaluate what they are doing to see if there are any ways they can improve. So I don't know about you, but I certainly have not arrived as a worship leader. I am always searching for ways to improve my skills, both as a musician and singer and also as a leader. So settle back, grab a pen and paper and take the time to evaluate your ministry during and after this podcast. Without being unduly harsh or critical of yourself, take the time to examine how you lead worship, and how you lead your team because there are so many ways we can do things and so many things we can say. I believe we should be on a quest to improve in every area of our lives and our ministries, and that's why we produced this podcast on evaluating your ministry. It could make all the difference as you face the New Year, and see God's power unleashed in your worship leading...I recently received an outline of standards for leading praise and worship , and I have asked Jane Sheneman, a worship leader who is going through a torrid time at the moment in her worship team. It seems that Jane believes in standards of excellence, but many of her team do not want to "commit" to these ideals. The fact is , leading praise and worship takes commitment. It takes time, it takes passion and Jane, like many worship leaders, gets very frustrated by the lack of commitment shown by her team members. So she decided to document what she believes is required to be a part of the worship team. When we are leading praise and worship we are leading a group of talented and sometimes brittle people. I have read this document and I think it is worth publishing on the blog so that you can comment on it, and also incorporate it into your team. It sets out the standards that we really require from our team, and it is a perfect way to introduce new team members so that they know what is required of them. Goal: To bring "GOD" glory, and people closer to Him through our worship service. Responsibilities: 1. A good testimony to the body (the church family). Cheerful . . . considerate . . .caring (not proud or boastful). 2. Praise Team members are the most visible leadership of the Worship Ministry. 3. A cooperative spirit within Praise Team. Attitude is more important than ability. There is no "I" in Team, but there is "US" in Jesus 4. Give of time to prepare and rehearse music outside rehearsals. You will be expected to listen to & learn the music on the CD provided. 5.Lead in worship. don't hesitate , that only brings confusion. You as leaders need to initiate singing, clapping and the lifting of hands( if appropriate) 6. Team members need to make worship and practice a priority in their lives. Dress: o LADIES: Slacks/Skirts/Dresses – Well below the knee! o MEN: No shorts, t-shirts, or flip-flops. Praise Teams rehearsal : Thursday 6:00-8 in the sanctuary: * Attendance and punctuality are very important factors for being a member of the music team(s). Rehearsals are only 2 hours per week, & 1/2 hour Sunday before Sunday School, That is SO little for such important work. Two things are required for every rehearsal: 1.Great Attitude! 2.ON TIME Arrival! *Make a habit that on time is 5-10 minutes early! In case you must be absent . . . you need to call or text "Jane Sheneman" as soon as you know you can not be there. If I am unavailable "leave a message on cell(1XXXXXX) or home(XXXXXXX) phone" I will get back to you as soon as possible. * Rehearsals are required, and members should arrive ready to work on the designated material. Poor attendance and punctuality reflect a lack of discipline and respect for the Lord's ministry. *a continued inability to be @ practice or arrive ontime means you will not be prepared & unable to lead with team in Sundays a.m. service. *Ministery often involves a sacrifice - this often expresses itself in a time commitment. A Lifestyle that is continually growing to conform to the image of Christ. * Participants must be born-again believers of Christ, and their lifestyle must resemble that of a born-again Christian. If there are problems along the moral line I will talk to the individual in question. If there is no improvement that person may need to talk with the pastor. *Because the Praise Team is a position of leadership an unwilling desire to adhere to church policy may result in being asked to step down. each case will be handled tactfully and confidentially with the aim of restoring your faith and ministry potential, keeping your confidence in the leadership of this ministry and the congregation. Teachable: This means No one has ever "arrived" - be open to one another and new ways of looking at things and correction. receive constructive criticism and be open to the comments and ideas of others. Humility is a virtue and James 4:6 says: But he gives more grace. Therefore it says, “God opposes the proud, but gives grace to the humble.” also Luke 14:11 says: For everyone who exalts himself will be humbled, and he who humbles himself will be exalted.” hum·ble 1.not proud or arrogant; modest: to be humble although successful. *any differences need to be dealt with in Love and seek to foster peace ( James 3:17) always build each other up with positive comments and affirmities. We need to strive as a "Team" to sacrifice our own wants and desires to see the greater good for the group and the church. realizing we are interdependant of each other and valueing what each of us brings to this ministry, welcoming and giving everyone a sense of belonging, and being considerate of each other. Philippians 2:1 -4 Imitating Christ’s Humility 1 Therefore if you have any encouragement from being united with Christ, if any comfort from his love, if any common sharing in the Spirit, if any tenderness and compassion, 2 then make my joy complete by being like-minded, having the same love, being one in spirit and of one mind. 3 Do nothing out of selfish ambition or vain conceit. Rather, in humility value others above yourselves, 4 not looking to your own interests but each of you to the interests of the others. Commited to Excellence: We should never " wing it" or "fly by the seat of our pants"! in any ministry and this should be reflected in our worship with careful planning, practicing and execution. This does not mean "professionalism" and we are not here to entertain people but we need to do our best and bring God the glory through our ministry. We should never be content with where we are at but always seek to become better at what we do and serve GOD with excellence. Prepare your heart to Worship Sunday morning we are often so rushed and harried that we are not in an attitude of worship. We need to take time as a team before we warm up to quiet our hearts, pray and ask the Lord to be in and with us throughout the service. Leading people in worship is a privilege and responsibility,you will be leading people toward the throne of God. Unity and a love for one another will effect our ability to do this. *Please note: These guidelines are meant to help us as a Team to grow towards Christ and each other, also to help us in our decisions and priorities. All who are interested in being a part of the Praise Team(s) will be required to sign a statement form which would be a mutual agreement between both parties. So what do you think? If you are leading praise and worship regularly in your church you may find this information very helpful! Evaluating your ministry is an essential part of growing your ministry and improving your skills in ministry. Sometimes we are afraid to evaluate what it is we are doing and how we do it, but if we ever want to improve our skills and abilities in worship ministry, we have to have some means of evaluating our performance. The end of the year is a great time to look back and have a frank and earnest look at how we have lead our worship team over the last 12 months. The fact is, whatever we cannot evaluate we cannot change. Or if we can change it, what do we change it into? evaluating your ministry is an essential part of getting better at the ministry the Lord has called you to. Even the best worship leaders on the planet constantly reevaluate what they are doing to see if there are any ways they can improve. So I don’t know about you, but I certainly have not arrived as a worship leader. I am always searching for ways to improve my skills, both as a musician and singer and also as a leader. So settle back, grab a pen and paper and take the time to evaluate your ministry during and after this podcast. Without being unduly harsh or critical of yourself, take the time to examine how you lead worship, and how you lead your team because there are so many ways we can do things and so many things we can say. I believe we should be on a quest to improve in every area of our lives and our ministries, and that’s why we produced this podcast on evaluating your ministry. I recently received an outline of standards for leading praise and worship , and I have asked Jane Sheneman, a worship leader who is going through a torrid time at the moment in her worship team. It seems that Jane believes in standards of excellence, but many of her team do not want to “commit” to these ideals. Not perfection, excellence, and particularly in the area of our attitudes and commitment to the Lord and each other. Little things like not turning up on time or criticizing team members can blow up in your face if you neglect them, so please read these ideas and see what you think. Goal: To bring “GOD” glory, and people closer to Him through our worship service. 1. A good testimony to the body (the church family). Cheerful . . . considerate . . .caring (not proud or boastful). 2. 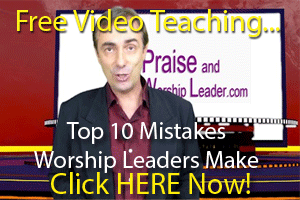 Praise Team members are the most visible leadership of the Worship Ministry. 3. A cooperative spirit within Praise Team. Attitude is more important than ability. 4. Give of time to prepare and rehearse music outside rehearsals. You will be expected to listen to & learn the music on the CD provided. 6. Team members need to make worship and practice a priority in their lives. o LADIES: Slacks/Skirts/Dresses – Well below the knee! o MEN: No shorts, t-shirts, or flip-flops. * Attendance and punctuality are very important factors for being a member of the music team(s). Rehearsals are only 2 hours per week, & 1/2 hour Sunday before Sunday School, That is SO little for such important work. *Make a habit that on time is 5-10 minutes early! In case you must be absent . . . you need to call or text “Jane Sheneman” as soon as you know you can not be there. If I am unavailable “leave a message on cell(1XXXXXX) or home(XXXXXXX) phone” I will get back to you as soon as possible. * Rehearsals are required, and members should arrive ready to work on the designated material. Poor attendance and punctuality reflect a lack of discipline and respect for the Lord’s ministry. *a continued inability to be @ practice or arrive ontime means you will not be prepared & unable to lead with team in Sundays a.m. service. *Ministery often involves a sacrifice – this often expresses itself in a time commitment. A Lifestyle that is continually growing to conform to the image of Christ. * Participants must be born-again believers of Christ, and their lifestyle must resemble that of a born-again Christian. If there are problems along the moral line I will talk to the individual in question. If there is no improvement that person may need to talk with the pastor. *Because the Praise Team is a position of leadership an unwilling desire to adhere to church policy may result in being asked to step down. This means No one has ever “arrived” – be open to one another and new ways of looking at things and correction. receive constructive criticism and be open to the comments and ideas of others. 1.not proud or arrogant; modest: to be humble although successful. always build each other up with positive comments and affirmities. We need to strive as a “Team” to sacrifice our own wants and desires to see the greater good for the group and the church. realizing we are interdependant of each other and valueing what each of us brings to this ministry, welcoming and giving everyone a sense of belonging, and being considerate of each other. We should never ” wing it” or “fly by the seat of our pants”! in any ministry and this should be reflected in our worship with careful planning, practicing and execution. This does not mean “professionalism” and we are not here to entertain people but we need to do our best and bring God the glory through our ministry. We should never be content with where we are at but always seek to become better at what we do and serve GOD with excellence. Sunday morning we are often so rushed and harried that we are not in an attitude of worship. We need to take time as a team before we warm up to quiet our hearts, pray and ask the Lord to be in and with us throughout the service. Leading people in worship is a privilege and responsibility,you will be leading people toward the throne of God. Unity and a love for one another will effect our ability to do this. These guidelines are meant to help us as a Team to grow towards Christ and each other, also to help us in our decisions and priorities. All who are interested in being a part of the Praise Team(s) will be required to sign a statement form which would be a mutual agreement between both parties. So what do you think? If you are leading praise and worship regularly in your church you may find this information very helpful!